Hello dear engineers. 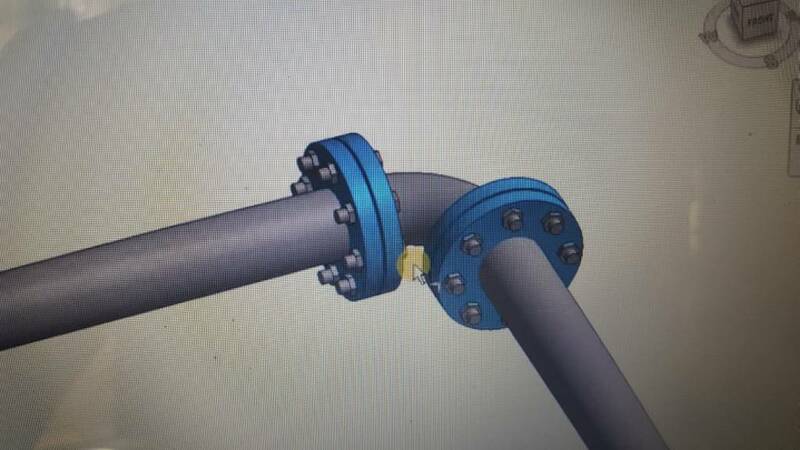 I'm working on a hospital project and need to model with LOD 350 in this case looking for Pipe flange family with nuts and bolts automatically creared. I'd appreciate you if anyone can help me with this. Well you seem to already have an example to start with..
You should make it as a separate flange family for a single flange, then load it into your pipe fittings. Make it parametric so it changes size based on a single pipe diameter parameter, then link this in the pipe fitting to the Nominal Diameter of the fitting. For example outside flange diameter = 2x pipe diameter, or whatever the relation is. The bolts can be made by modelling one bolt, with a parameter for its position from the centre of the pipe, then rotate with an array. That way you can also link the radius of the bolt circle to the pipe size. Thank you joseph for answering. Actually i add nuts and bolts manually to flange i mean I've create them and after finishing piping one by one add nuts and bolts to flange. In this case i need a family or guide to create them in parametric way. If you add the bolts to your flange family and array them around the center, you can make a parameter that calculates the amount of nuts for the diameter of the flange. Should be doable for sure, will take some time, but you will be able to use that flange for every pipe size. Thanks Robin. I've tried it but for big sizes i have problem. I mean maybe i don't know how to create correct parameter for them. Exactly i use a flange catalogue for size and number of bolts then create parameters but couldn't get my acceptable result. Still have a serious problem with formula part.